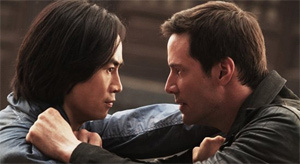 Man of Tai Chi, Keanu Reeves’ directorial debut, had gotten mediocre buzz in Toronto. So I was pleasantly surprised to see a not-half-bad modern kung fu movie. Director Reeves leaves “likeable protagonist” duties to Tiger Chen, a former stuntman on two Matrix movies. Chen plays a man named “Tiger Chen,” a delivery man in Hong Kong who studies with Yang (Yu Hai), a Tai Chi master. His master says Tiger shows promise, but resorts too quickly to power and attack, rather than flow and avoidance. Tiger needs to meditate more, says Yang. Yang doesn’t know that Tiger has joined a martial arts competition as a Tai Chi fighter — which is a contradiction because Tai Chi is not supposed to be a fighting style. Reeves casts himself as Donaka Mark, a wealthy, eccentric Hong Kong businessman who sells death as entertainment. In his role, Reeves sticks to a concrete grimace — not convincing or interesting, but at least not usually embarrassing. His one evil laugh, late in the film, is unintentionally funny. He operates a shadowy fighting club where competitors fight to the death. A cop by the name of Jing Si (Karen Mok) is investigating reports by one of the fighters. He called the police when he found out he was supposed to fight to the death. The cops did not arrive in time to stop his fight, and when the conscientious fighter refused to kill his opponent, Donaka himself intervened and killed both of them. Donaka sees a broadcast of one of Tiger’s sanctioned tournament fights and sends him a an offer for private employment. He gives no hint about fighting to the death; just fighting in a strange office space with a big two-way mirror, followed by generous payments, for as long as Tiger keeps winning. Some of the most impressive choreographed moves are Tiger’s flying takedowns of unnamed opponents in this cubicle-fabric ring. With just a couple of notable exceptions, the fights look more physical than magical. At the same time, some of the most impressive moves don’t must have been aided by wires or computers. Action direction is credited to the great Yuen Woo-ping, aided by four action choreographers. After passing his “interview” — Tiger gets jumped by an attacker who uses his necktie to try to strangle him — Tiger considers turning down the job. “I can’t fight Tai Chi for money, its dishonorable.” But Donaka finds a way to motivate Tiger with money. A day later, the master’s temple is notified that it will be torn down and the master evicted in 30 days. Tiger fights to pay for his expensive appeal for historical preservation. It’s interesting to see that Tiger turns pretty quickly. Although he remains a nice guy motivated by good, he seems darkly addicted to fighting and winning. He goes from saying “it’s dishonorable,” to buying a new car for himself and appliances for his parents. It’s not long before he’s the attacker in the office space taking on the surprised interviewees. There is an interesting turning point in the film — consider this a spoiler — where Donaka reveals that he was less interested in fights to the death than in the corruption of innocence. If true, then Donaka had already won, and Chen’s story is on a par with Greek tragedy. Unfortunately, the movie doesn’t play like a Greek tragedy, and Donaka’s revelation doesn’t feel like an ending. Emotionally, the film demands a big showdown, which means that the interesting idea of corruption was just a tossaway line of dialogue — very interesting, but belonging to a whole different film. At least Man of Tai Chi flirts with originality, and at least it’s good enough to settle for merely satisfying. Not bad for a freshman effort.